From an antiquity the Athos peninsula has been populated with Thracian and Macedonian tribes, then colonists from continent - aciant greeks and pelags. All sea routes connecting Greece with the East, passed through Athos. Its two-kilometre peak was as a leading light visible for tens of miles. Towards the end of Trojan war (1000 years B.C.) 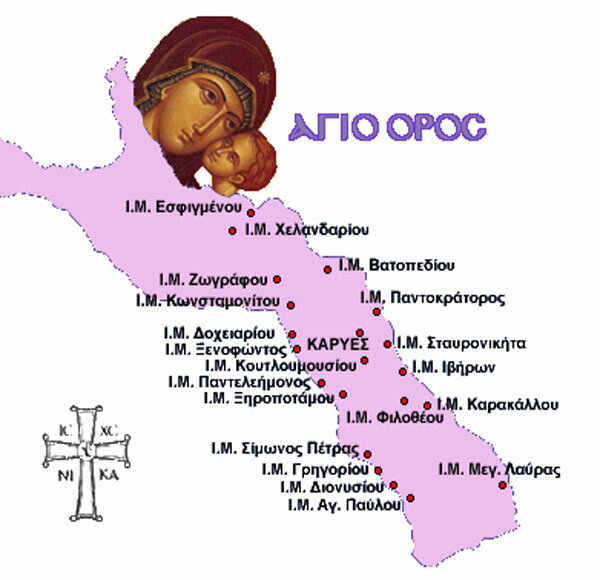 on a place of present big monasteries pagans have based their cities with democracy and greek multi-deity: Olofix, where nowadays is Esfigmenos, Dion - where is Vatoped, Fissos - where is Pantokrator, Kleon - where is Iver, Akroafos at the top of Athos, Haradary near the Dafni, Skolos at Zografsky landing stage. conquering. According the legend, between the victorious campaigns he had a rest three days on Athos - within present Karei. Alexander the Great's architect, saying that peak of Athos was symbol of the eternity for the civilisation of that time, has suggested to the greatest conqueror to change white-marble top in an enormous statue of Zeus with a city in the left hand and a stream flowing in the sea - from the right hand. Alexander has reasonably refused to a vain invention, having told that «inhabitants of a such city will have nothing to eat, and from such water source there will be nothing to drink». In 168 year b.c. Afon together with Macedonia has fallen under sovereignty of Rome, and settlements of its became quickly to fall into decay. Till bringing here Christianity not a lot villages have survived, engaging of cultivation of grape and olive groves. Light of evangelical's true has lighted up Athos in number of first enlighted places of Roman empire. Holy Mater has selected it in her lot. About the middle of I century of a Christian era in Apollonii Athos (near the small town Ierissos standing on border of Athos with continent) St. apostle Pavel preached on a way from Amfiopolja in Solun. In first three centuries AD, at the time of severe persecutions on Christianity, Athos with its dense woods, deep gorges and unapproachable rocks sheltered Christians escaping from prosecutions. Then have appeared and the first eremites. Apostle Konstantin the Great (306-337), like the actions that has made in the Sacred Earth,has decorated with Christian temples and Athos. Under the legend, them was three - about settlements, on which place now ia Karea, Vatopedsky and Iversky monasteries. At these temples appeared the first inhabitants. For a short while detained at Juliane the Turncoat the Christianity has quite affirmed as development already at Feodosiya Great (379-395 ?? ), destroyed on Athos last traces of paganism. The daughter Feodosiya, tsarina Plakidija, wished to see Sacred Mountain and the Vatopedsky monastery restored by the father when has arrived to Athos (382) and entered into the Blagoveshchensk temple, has heard from an icon of Bozhiej of Mother named subsequently "Predvozvestitelnitsej", a voice, ruling to it to leave from limits of Athos. This event has formed the basis to the initial establishment forbidding to women to appear on the Sacred Mountain. In V century AD tsarina Pulherija has created two monasteries - on a place of present Esfigmena and Ksiropotama. Ancient Athos monasteries have been controlled by saint authorities of Solun metropolitans. Pauperisation of Athos owing to invasion in V-VI centuries of barbarians - Bulgarians, the Slavs,cutting off its (Athos) sea trades with Asia Minor, Constantinople and seaside Thrace, has drived to eviction from Sacred Mountain of inhabitants and to a settlement on Athos only monks and then Athos has become «Belly of Heaven Queen». Emperor Konstantin IV (668-685) after heavy wars with hazars and Persians has been compelled to conclude the agreement with the Arabs who have accepted Mohammedanism, on a lasting peace by refusal of Syria, Palestin and Egypt in which were concentrated the most ancient centres of Christian self-sacrifice. On VI Universal Cathedral, in 680, it was accepted the church decision (a rule 18) to give in the order of Mohammedans who persue the monks, the monasteries of Athos destroyed by Arabs. Imperial stuff confirmed for monks Sacred Mountain as exclusively their property (Konstantin's IV decree, 676), protected their calmness from encroachments imperial servants and simple people (Vasily Makedonianin, 872). After these fatal decisions for Orthodoxy, despite a triple devastation of Athos by barbarians (in 670, 830 and 866), monastic population at the time of emperor Vasily Porfirorodniy (976-1025) has reached to 50 000 persons.